Discover Soldering Secrets! 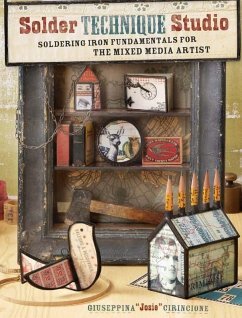 Whether you've never soldered before or are used to using your soldering iron primarily for stained glass, you will discover a bounteous new world of artistic possibilities in Solder Technique Studio. 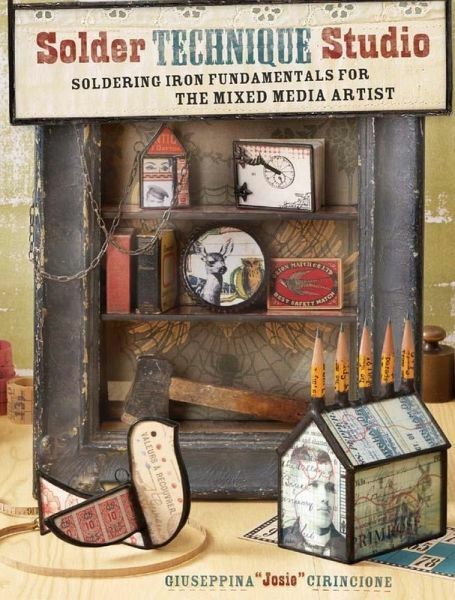 Workshop instructor, artist and author, Giuseppina "Josie" Cirincione shares in-depth information about everything from materials for soldering and glass cutting to previously unpublished soldering techniques, such as attaching jump rings using two pieces of glass. Follow along with 14 step-by-step projects, such as a wall shelf, an eyeglass pendant, bottle topper, a glass book and so many more! Inside you'll find Thorough soldering and glass cutting techniques, including detailed descriptions of materials with step-by-step photographs. 14 dimensional projects shown step-by-step, and incorporating a variety of mixed-media materials such as previously brewed tea bags, pencils, alcohol inks and much more. Techniques and projects to use beyond mixed-media art, to include stained glass and jewelry work. Giuseppina Cirincione is also the author of Collage Lost and Found (2006), and Bent, Bound and Stitched (2008), as well as a contributor to several other North Light titles. Additionally, her work has been published in numerous Stampington publications. She regularly teaches jewelry and mixed-media workshops throughout Arizona.